Home » Politics & Public Affairs » Polygamy in Canada? Canadians say "No Way"
Polygamy in Canada? Canadians say "No Way"
With the British Columbia Supreme Court poised to render a decision on polygamy in the province, Abacus Data posed two questions to Canadians about this controversial subject. 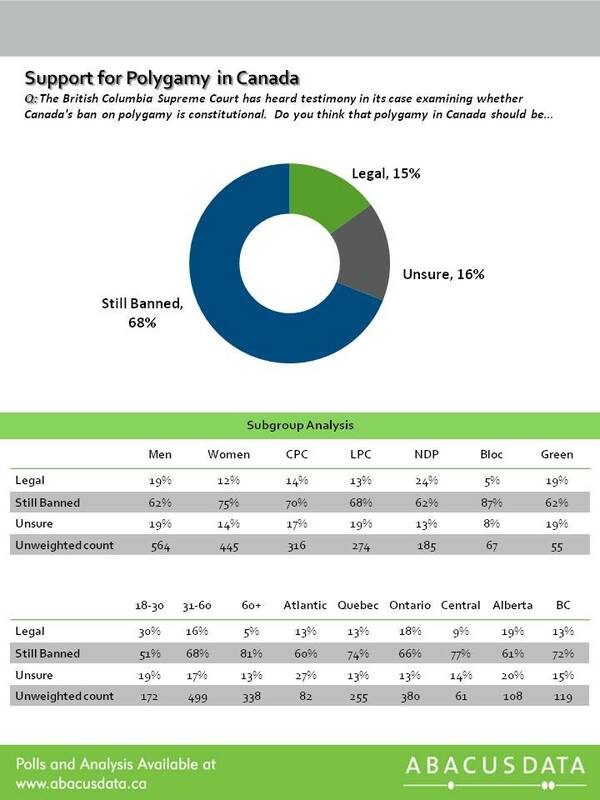 When asked whether polygamy should be legalized or remain banned, over two thirds of Canadians (68%) said they support continuing the ban. Women were more likely than men (75% and 62%, respectively) to support a continued ban. While partisanship did not seem to play a role, as there were high opposition scores across all parties, regional support for legalization was strongest in Alberta, at 19%. Interesting, the largest demographic differences in sentiment towards polygamy was age. Canadians over 60 were more likely to be opposed (81% opposed), while those under 30 were least likely to be opposed (51% opposed). While significant, this difference may be a result of a general resistance to government involvement in private life on the part of younger Canadians, rather than the acceptance of polygamy as a practice. The second question dealt with what course the government should pursue if the polygamy ban were to be ruled unconstitutional. If that were the case, a majority of Canadians (56%) would support the government using all means necessary to fight the ruling.